Many retinal conditions are incurable, but early detection and appropriate treatments can slow the progression of these diseases and prevent vision loss. Age-related macular degeneration is one such condition. At Retina Associates in Kansas City, MO, we recommend patients get regular eye exams, especially as they get older, which can ensure such conditions are detected and treated as early as possible. Age-related macular degeneration treatments vary depending on the stage of the condition and the type you have. Our doctors can give you a detailed diagnosis and begin treatment right away. The macula is the portion of the retina responsible for central vision. It makes tasks like reading and driving possible, while also allowing us to recognize faces and see fine details. As we age, the macula begins to degenerate, resulting in poor central vision. 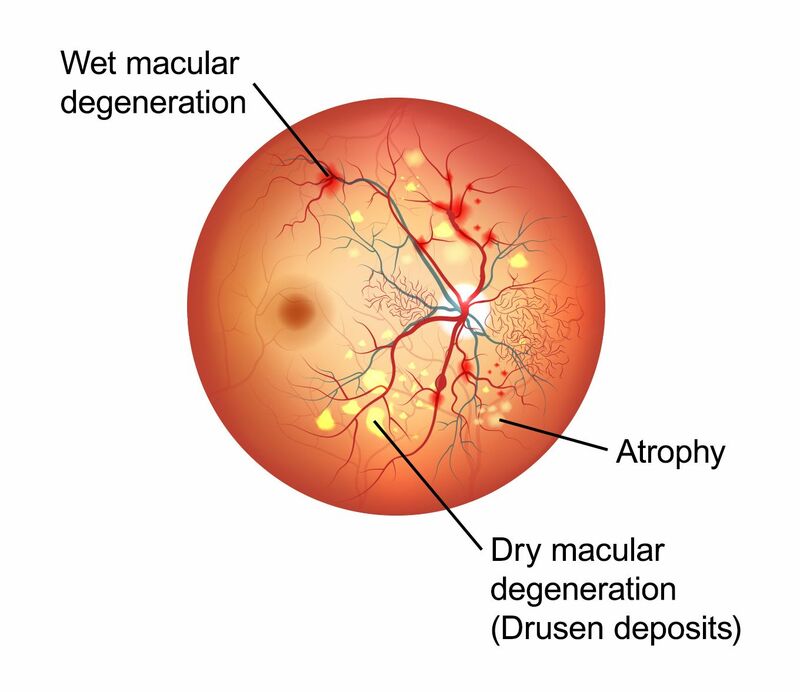 There are two types of age-related macular degeneration (AMD): dry and wet. With dry AMD, the macula dries out due to deposits of a yellow substance known as drusen. Dry AMD is the most common form, however, it can eventually develop into wet AMD. The wet form of AMD is caused by an abnormal growth of blood vessels beneath the retina and macula. Over time, they bleed, leaking fluid that causes the macula to lift away from its position on the retina. At this point in time, there is no known cause of AMD. Age is the biggest risk factor, as the disease becomes more and more common in people over age 55. Smokers are twice as likely to develop AMD, and genetics may also play a role. Changes in the central vision progress much more slowly with dry AMD. Patients may experience blurriness when looking at objects head on, and lines that are straight may appear wavy. Wet AMD progresses much more rapidly, and patients may also notice waviness to straight lines, as well as dark spots in their central vision. Although treatment options for dry and wet AMD differ significantly, the key to both is early detection and prompt treatment. Therefore, patients must commit to getting regular eye exams, which can allow us to diagnose AMD well before it has begun to noticeably affect the central vision. Unfortunately, treatments for dry AMD are limited. Nutritional supplements and changes to a patient’s diet may slow the progression of dry AMD. Increasing vitamins and minerals, such as vitamins C and E and copper and zinc are commonly recommended. Treatments for wet AMD are much more intensive. Medications, which are injected into the eye, can inhibit the growth of abnormal blood vessels and significantly reduce leakage. Laser surgery may also be used to cauterize leaking blood vessels. Both options can significantly slow the progression of wet AMD. Any changes in your vision should be taken seriously. Without prompt treatment, many eye diseases can result in permanent vision loss. If you have noticed even slight changes to your central vision, contact Retina Associates today to schedule an exam.